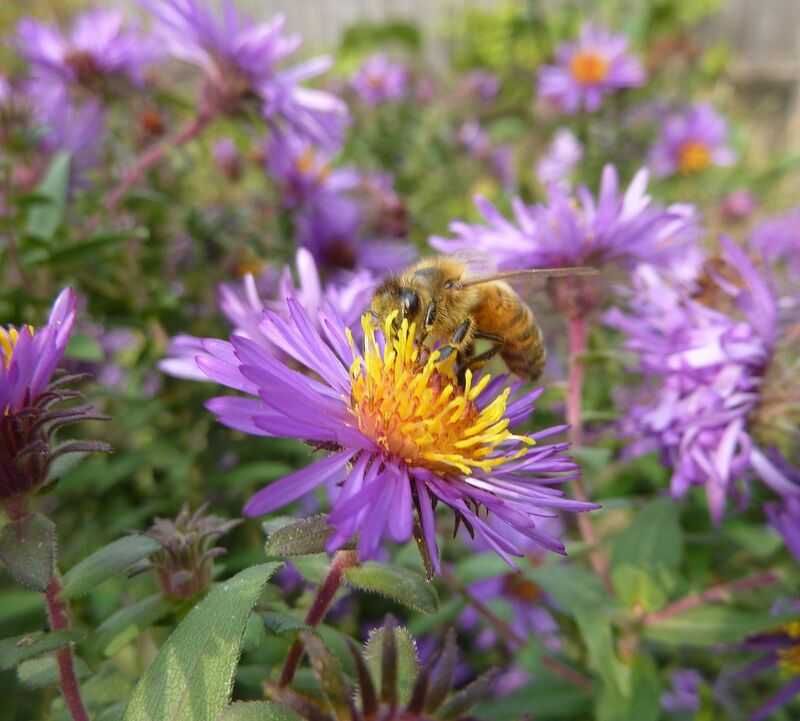 Are Nonnative Only Gardens Starving Fall Pollinators? 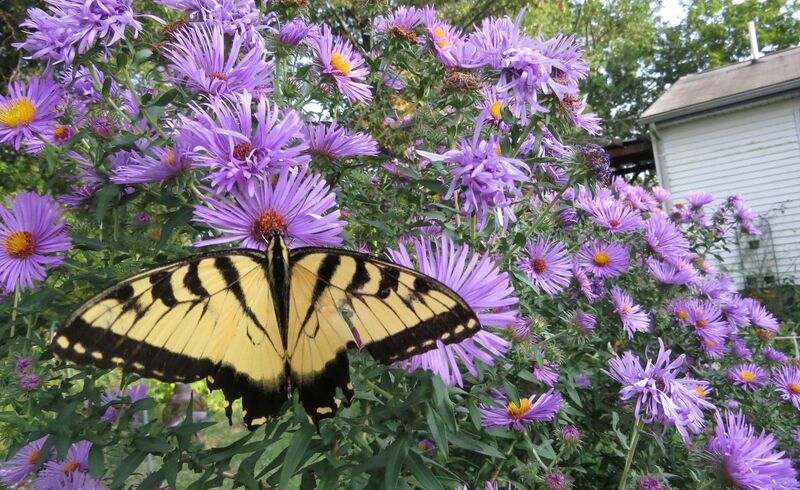 So on Facebook I follow the Monarch Butterfly Garden because they occasionally have articles I like to read. 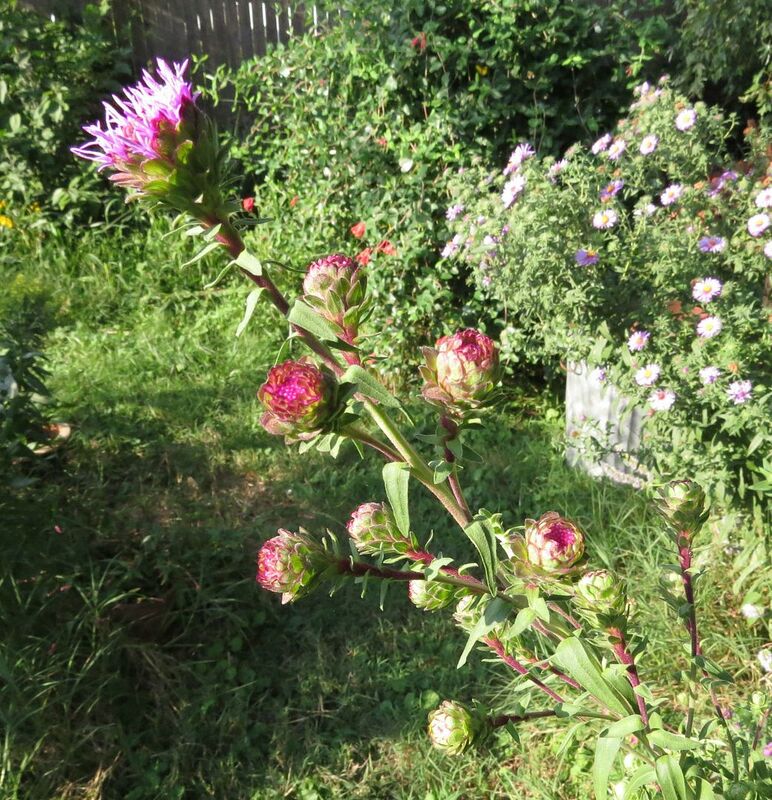 Most recently they had this little jewel, "Are 'Native Only' Gardens Starving Fall Pollinators?" I figure anything with an offensive title surely must be worth reading. The author boasts that bees are working their Dahlias, they're on Tropical Milkweed, and Verbena. They state that these flower until the first frost. Then they have these pop out quotes in the middle of their article that I don't understand. I guess it's the title sentence to what they're going to talk about next. I’m here to tell serious wildlife gardeners, that if you want to support fall pollinators, a native-only mentality will keep you from achieving that goal. And then he goes on to list 5 plants: Tropical Milkweed because it's the ONLY milkweed that flowers until frost. I suppose that's true but milkweed nectar isn't really that vital to the ecosystem, especially in autumn when all their pollinators have gone dormant or flown south. He makes some interesting observations about Monarchs not finishing their migration because they hang around too long and get taken in by winter's chill or just expire. To be honest I'm on the author's side with this one not because it's a valid concern but because I don't know how anyone would judge that and not rule out climate change or something like that. He recommends cutting the plants down later in the year especially if you're in Florida or Texas, which makes sense to me, so good on him there. 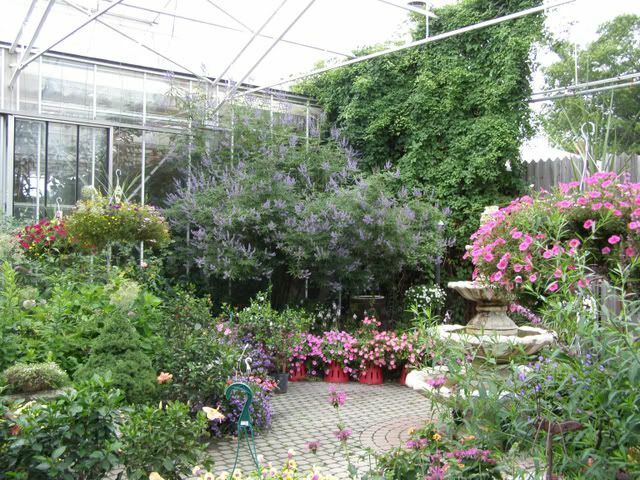 Butterfly Bush is his second recommendation. This IS the plant that I am in awe of for it's long bloom period! I can't name a single plant that blooms as long as this one and gets the pollinators that it does. The problem I have with them though is they require way too much attention. 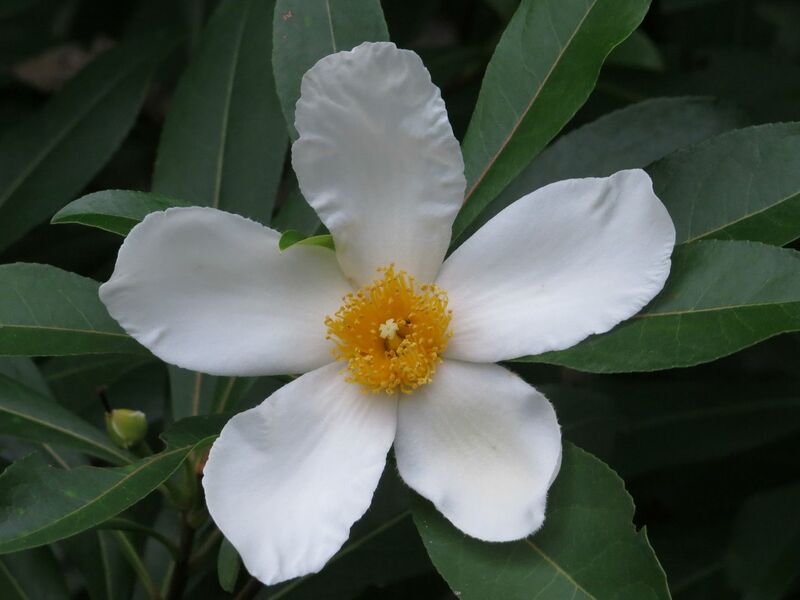 Plants want to become 10 by 10 shrubs, but dwarf varieties are now available. The issue here is smaller plants produce fewer flowers, thus attracting less pollinators, so they're a silver medal but still good. 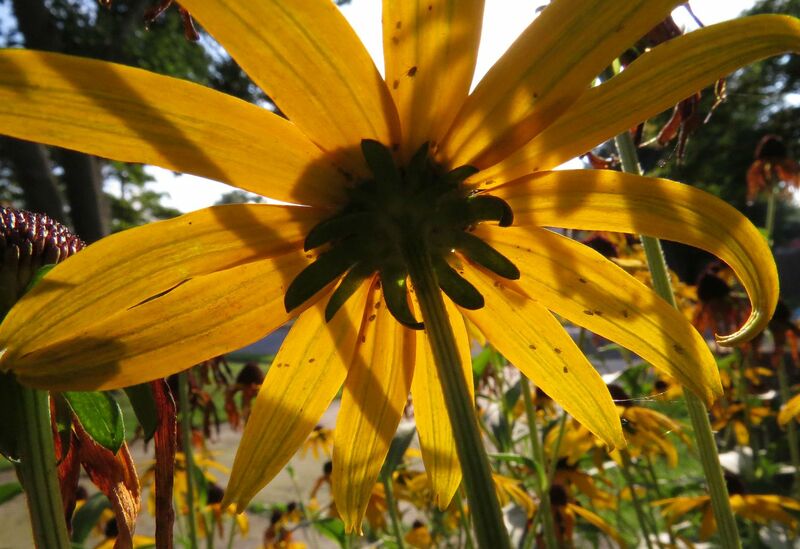 The next issue is the flowers are short lived, seed pods are not showy, and they require so much pruning to prolong, making it impossible to keep them in a nice looking shape. There are non-aggressive varieties now available, but that's what they said about the Bradford Pear. 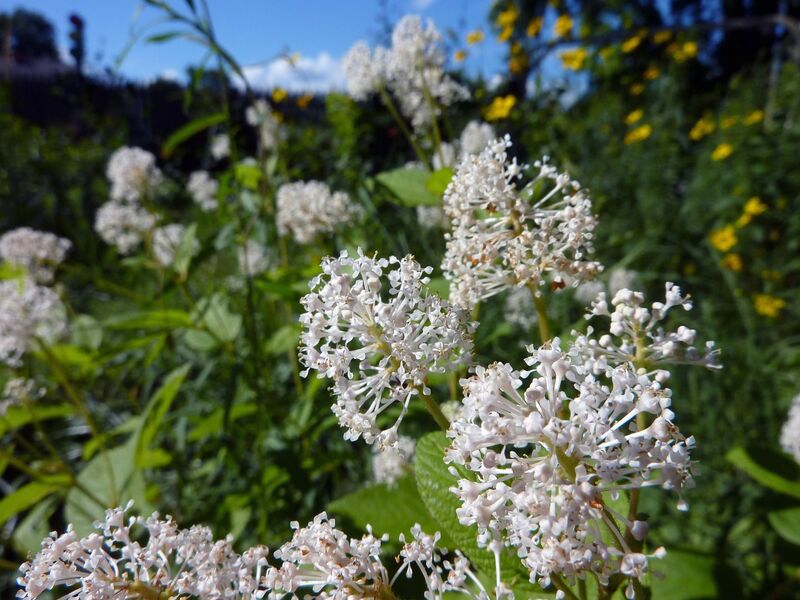 The aggressive varieties of Butterfly Bush are still available for sale and take over wetland ares to the point where they exterminate wild communities of carnivorous plants, native orchids, and other rare bog plants. You basically have to go kayaking to see them at their worst but they're otherwise an ... okay ... shrub. Keep them in the formal gardens well away from the wetlands. That's why I don't plant them, and I hate promoting them. They're a novelty item at best and every gardener I know who's ever planted one has had it removed with in a few years because they just grow to be too much of a hassle. 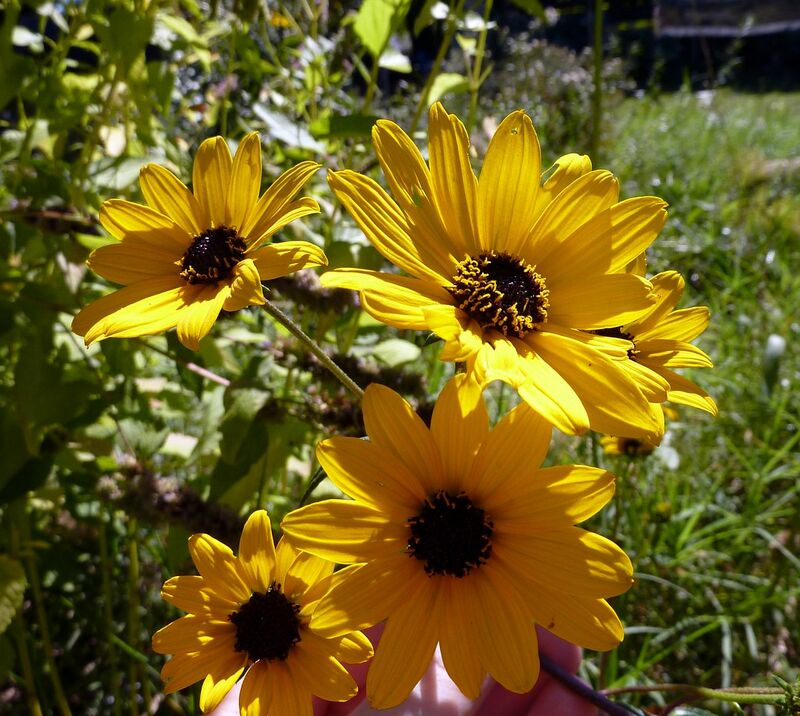 Mexican Sunflowers... Good pick, great plant, I actually grow have them in my garden right now! I love the color, they're not aggressive... unless you live in Georgia or anywhere south. They do self seed a little in Florida where other members of the genus can be found. One is called Tree Marigold, Tithonia diversifolia, which I believe is a bit more of a problem but doesn't sound like anything more harmful than some of our perennial sunflowers. Cramer's Amazon Celosia and Zinnias are the last two. Honestly I don't have an opinion on either. 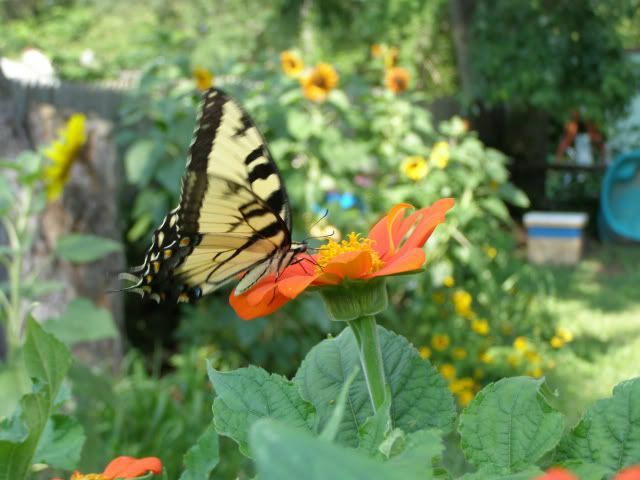 Zinnias are great nectar plants but you need a few dozen flowers to really get any attention. Some varieties get powdery mildew really bad too but not always. 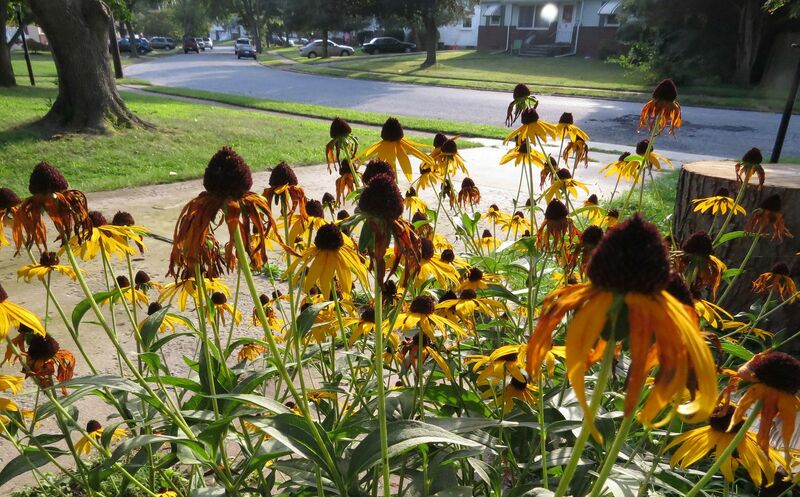 it begs the question if the author even grows any fall blooming native plants at all. I left a comment on the article (found below), as well as sharing it myself and the author did reply to me. 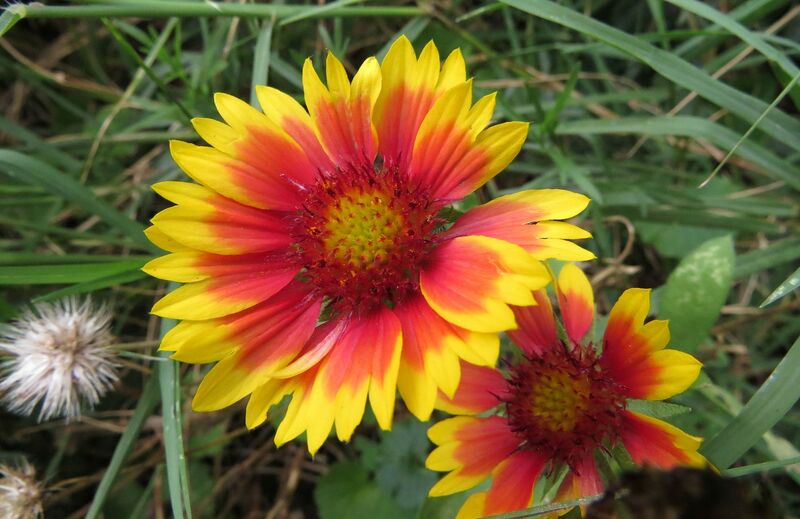 Chris, I do have fall blooming native plants and so do most people that have annual/exotic plants in their gardens. If you read the article, I'm suggesting that a mix of native and non-invasive exotic plants is capable of sustaining more pollinators. 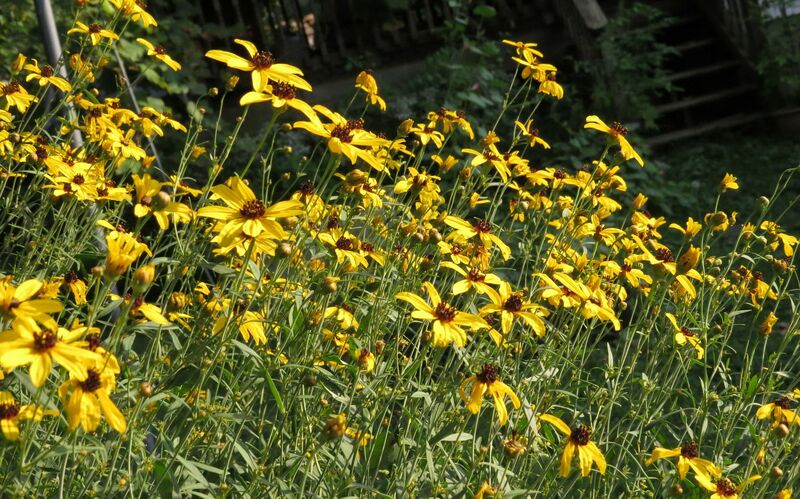 Too often, native-only gardeners discount plant options solely on the basis of whether or not they're native. This isn't 1950. The landscape of North America is vastly different and trying to hold on to "what was" by turning a blind eye to reality isn't doing the pollinators any favors. In a time of unprecedented change, ALL options should be given fair consideration. So basically he's giving me a gold star for having an opinion because deep down we're all winners, you know, the middle finger, but with your words. So he titles the article Native Only Gardens Starving Fall Pollinators and doesn't talk about whether or not that's true at all. He just lists his five plants, ant that's the end. I know the ecosystem isn't like it was in the 1950's, go watch the movie Mall Rats and hear Jay and Silent Bob discuss the delicate balance of the shopping mall ecosystem (that they build over the actual ecosystem). 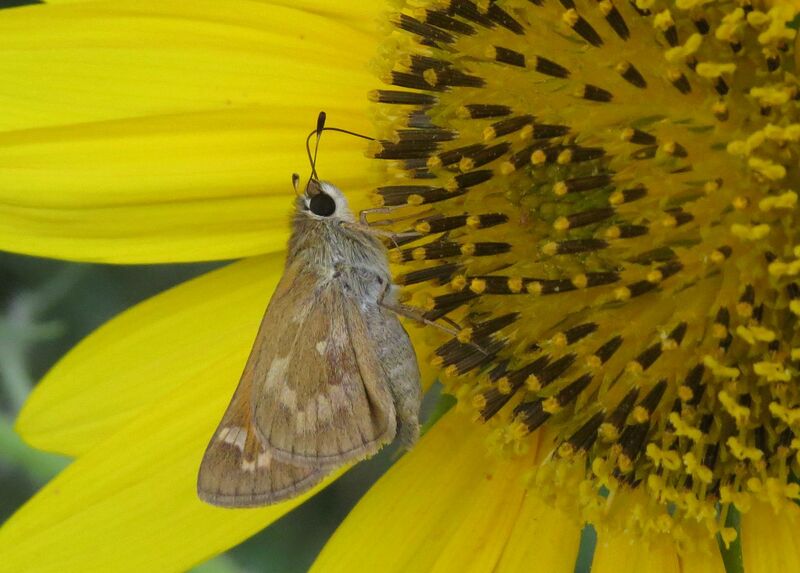 There are currently dozens of Asters, Bonesets, Goldenrods and Perennial Sunflowers currently in bloom that have sustained pollinators since before Europeans landed on this continent. Sure that flat of Zinnias or whatever you bought at the garden center might still be flowering and I'm sure they add a pop of color but don't assume they're single handily saving the world. You know what butterflies love? Rotting Fruit, the more maggots the better. You got old cat food in the recycling bin? Bees love it! 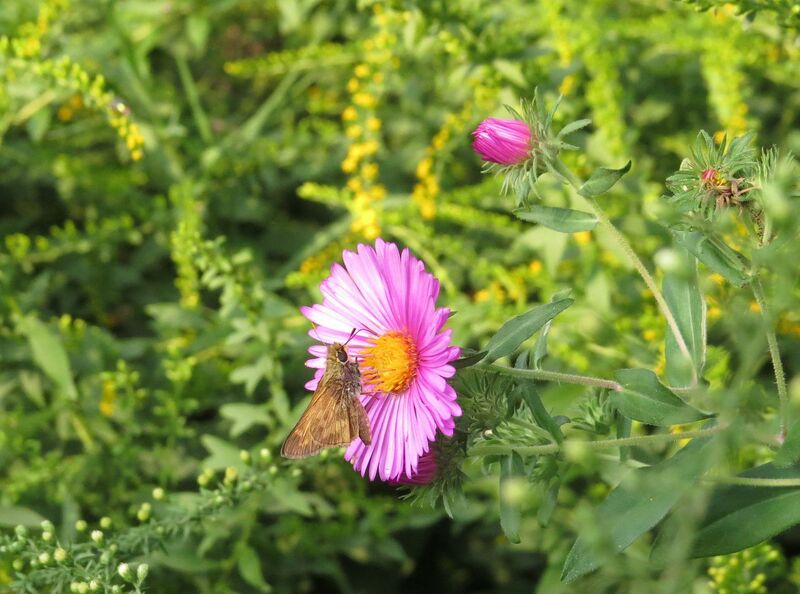 The bottom line is pollinators are just out to get a meal. It's basically sugar water, and the abundance of pollinators isn't really an accurate judge of what your garden is doing for the environment. Of course you need pollinators for plants to produce fruit and seeds but this is only a part of the equation. People boast about how New Jersey Tea, Ceanothus americanus, a native plant, as a great hummingbird magnet because they eat the small pollinators that tend to swarm around the plant. I have yet to hear of a nonnative plant that supports bird life in this way. I'm certain it happens, I'm certain that small bees are common pray items for birds, but overwhelmingly caterpillars tend to be more sought after. Usually Native Plant Gardeners immediately jump to quoting Tallamy and talk about caterpillar host plants which make up the majority of a baby bird's diet. 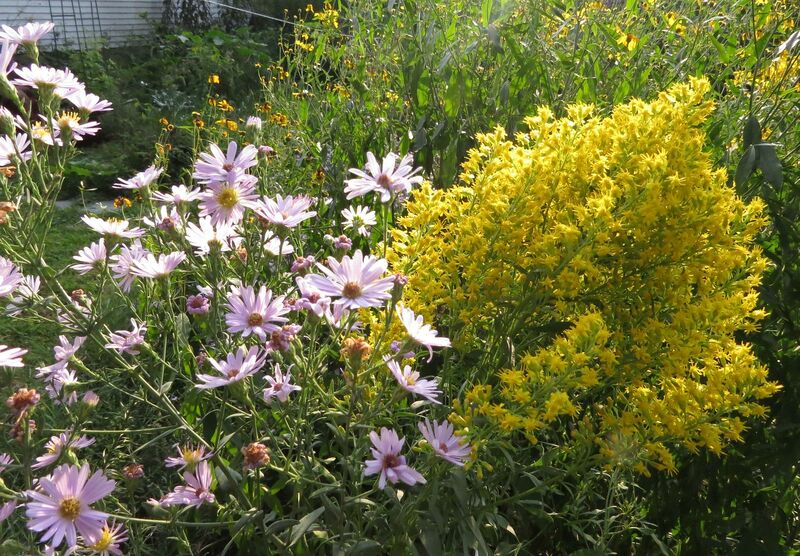 This is where the beauty of native plants lay. It's hard to argue the benefits of pollinators because they're not as devoted to a particular plant the way Lepidoptera are. 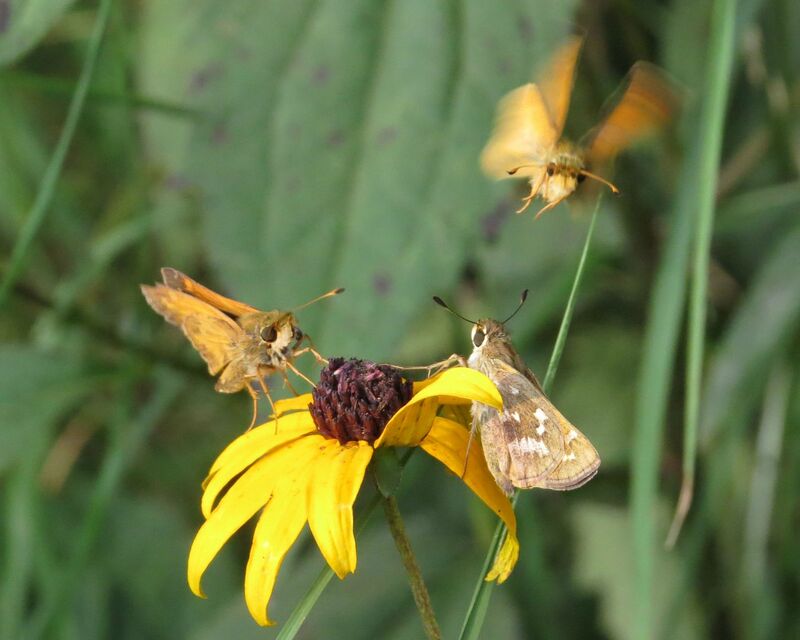 When we talk about pollinator specialists we're not talking about nectar, we're talking about pollen. There is this assumption that pollen is pollen is pollen but that's wrong. By that logic, seminal fluid of a blue whale would be compatible with a field mouse. Insects of course aren't using pollen for its intended purpose of course, they're eating it! They feed it to their young and the nutritional value varies dramatically from each plant species. Because there's no point in foraging when their special diet isn't available, they time the adult stage of their life cycle to coincide with the bloom of their host plant(s). Now the author of the article does hint at this saying that climate change can throw off the bloom period and extreme weather is becoming a bigger issue, and the risk of a pollinator emerging at the wrong time is a very real issue. But I'll point out that more than 90% of bees and wasps (but not all of Hymenoptera) are not social and follow this annual life cycle pattern to partake of generally whatever happens to be in bloom. Here though it's a shot in the dark, because historically they've only been able to work the native plants that grew in North America before Columbus landed. Even when they're just given their native plants to pick from their larva received a different diet depending on what plant the parent worked. Some species can't develop on some plants while others had the opposite effect with the same plants. So they are specialized pollinators, but they still forage on whatever is flowering, the same way birds will happily eat seeds from your feeder but mostly can't raise their young on seeds alone. 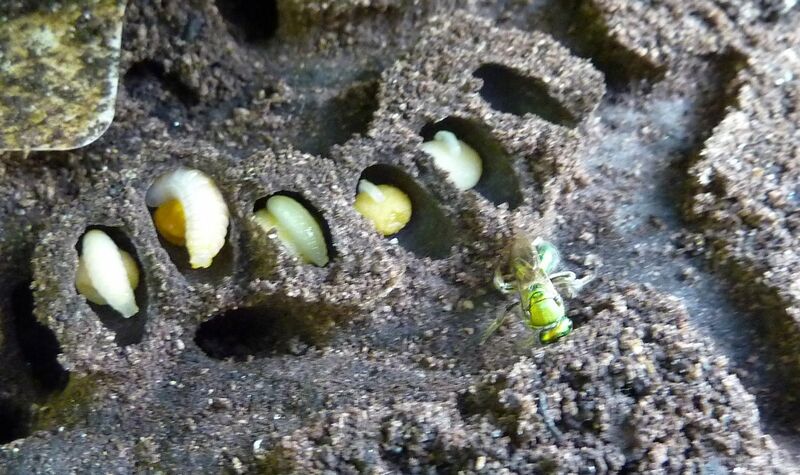 Here is the nest of a solitary bee. Note how each pollen ball in each cell is a different color. This indicates that the bee only collected pollen from one type of plant per pollen ball. By diversifying their pollen source they can help ensure at least some of their young will get an ideal diet and develop into full sized adults. 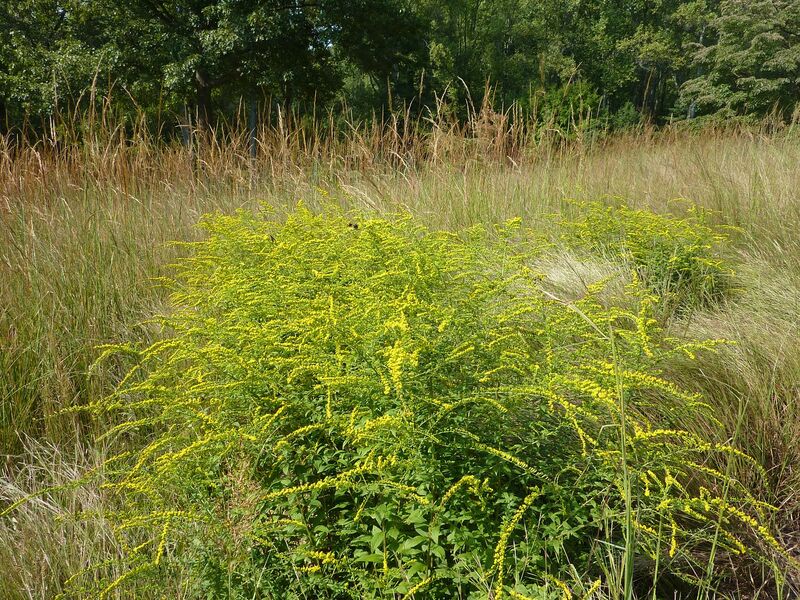 It's wrong to conclude that by adding nonnative plants to the mix we increase those odds of success. Because this isn't a specialist species, they don't know what plant is ideal for their offspring to consume, it's also likely there are flowers out there mimicking those of plants theses bees want to pollinate. When we plant nonnatives this increases the competition at the local flower pageant and the best choice doesn't always get picked. Also, many solitary bees only make about 40 cells and that's it, the adult stage is dead for the year! This implies that each individual bee can choose somewhere up to 40 individual plants to work. Now chances are some of the nonnatives are perfectly fine for native bees to work. 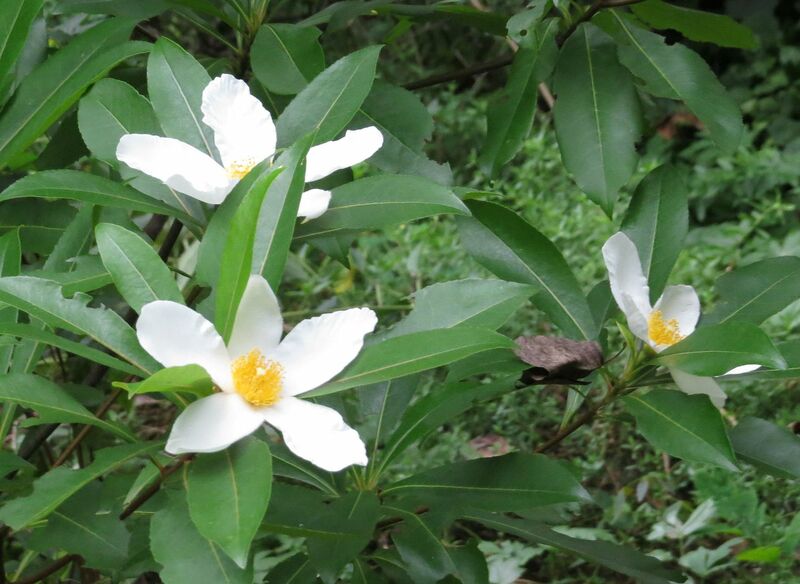 But as with judging whether or not a plant is invasive, it needs to be discussed on an individual basis. It may be good, it may be bad. Increasing the plant diversity just makes the issue more confusing, and replacing what used to work or might have worked with nonnatives is more than likely to have negative results in bee diversity. Though they may work these plants it doesn't mean it's good for them. So here is my response to his initial post on Facebook. Pictures have been added in later. 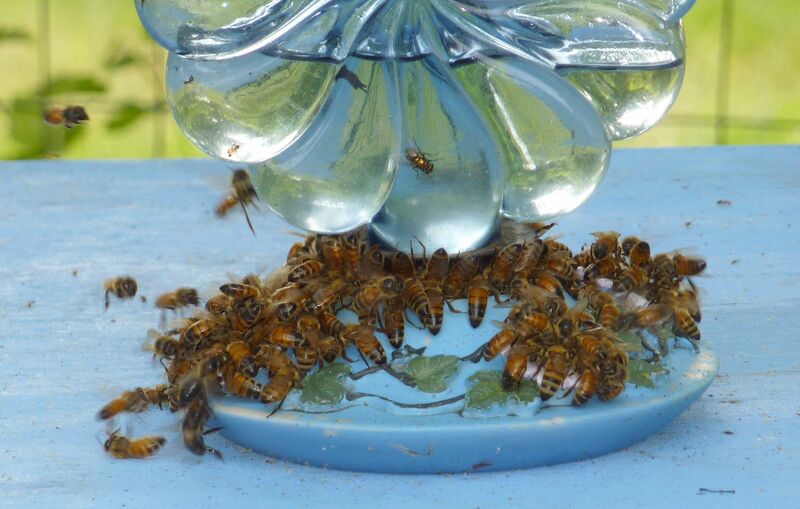 Me: Nectar isn't really a good judge of what adds biodiversity because you can often get the same results by spilling soda, or drilling bigger holes in your hummingbird feeder. A carbohydrate is a carbohydrate no matter what the source. Also Bumblebees will pretty much work anything so saying they will work something isn't really as impressive as a Monarch Butterfly. 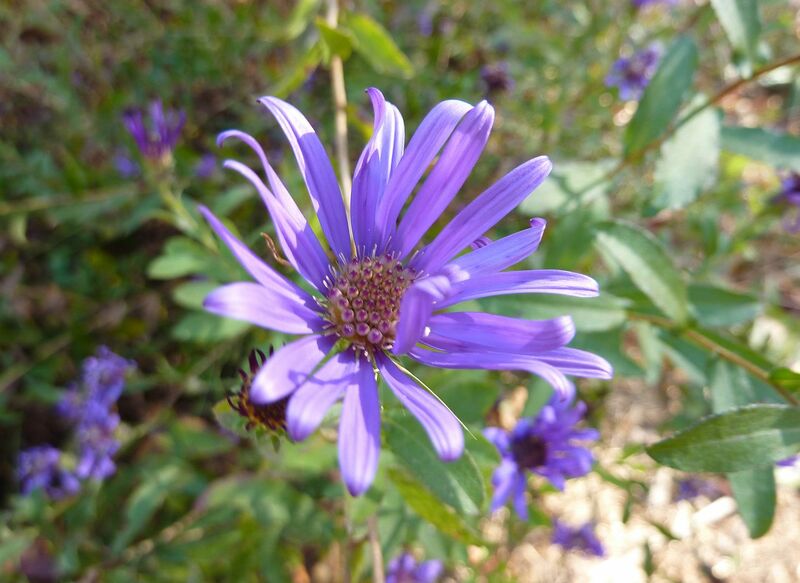 Symphyotrichum novae-angliae, is a great nectar plant for bees and butterflies. 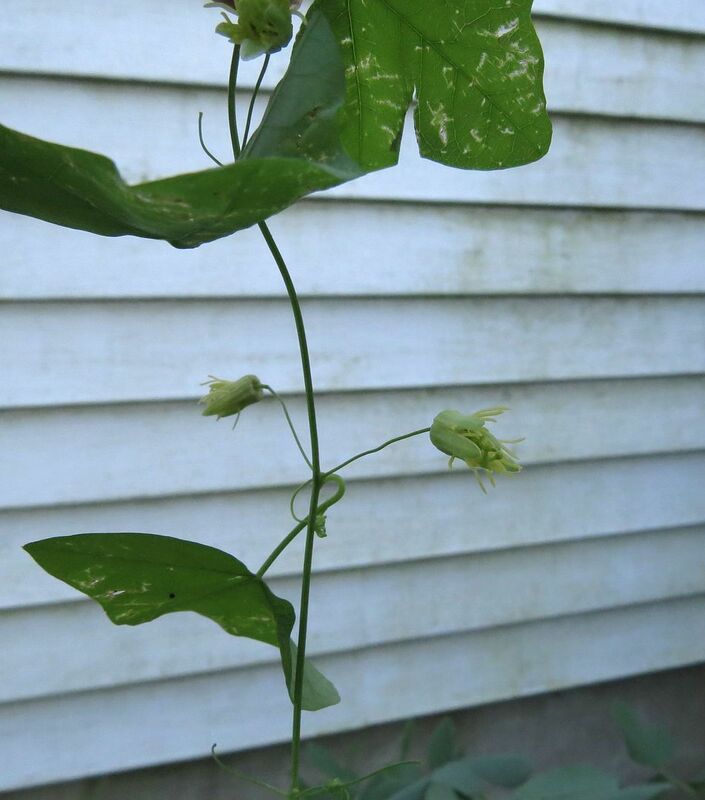 Can seed a little prolifically when more multiple plants are pollinated together. 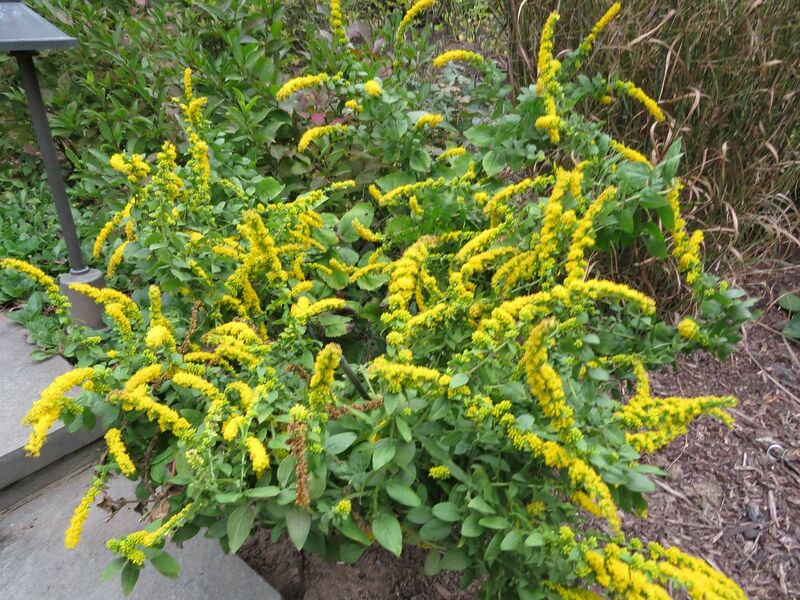 Solidago rugosa 'fireworks' starts flowering in September, not aggressive spreading either by runners or seeds as other Goldenrods tend to be. 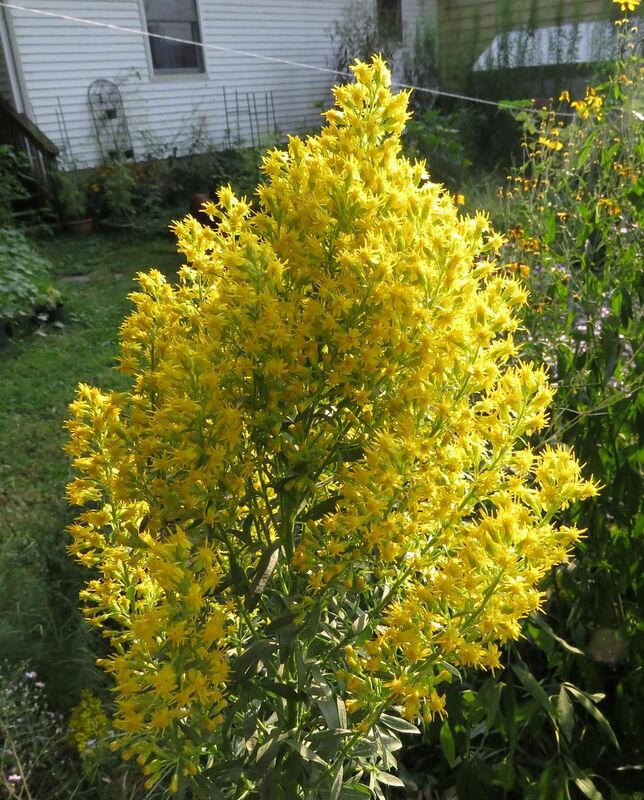 Solidago speciosa, a showy Goldenrod species who's flowers cluster at the top like a scepter. 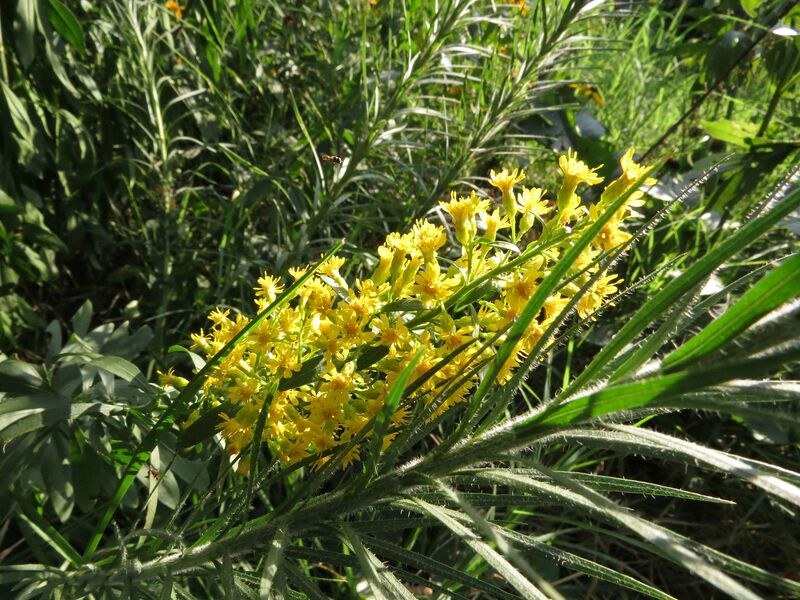 Solidago drummondii, something of a newcomer to the ornamental trade, not aggressive and likes growing in those dry rocky trouble spots. 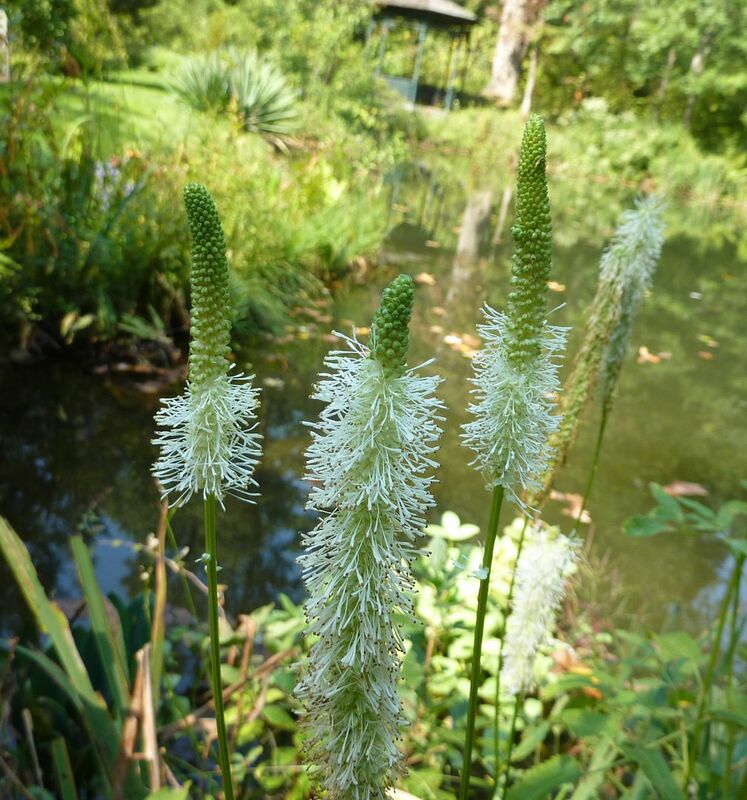 Sanguisorba canadensis, flower often survive the first few frosts! Helianthus angustifolius, starts flowering in October, though I'll admit perennial sunflowers can be a little aggressive spreading. 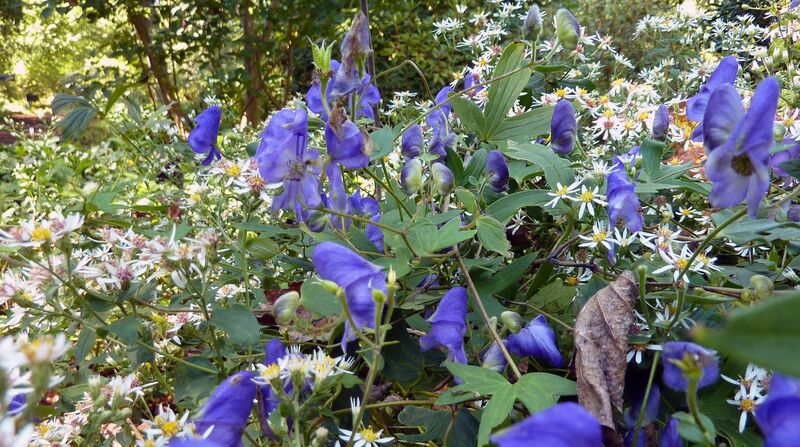 Aconitum uncinatum, though toxic to eat, the flowers are unusually good for Monarchs when grown in abundance. Actaea racemosa, mostly attracts flies and pollinating members of the mosquito family but does an okay job with bumblebees too. 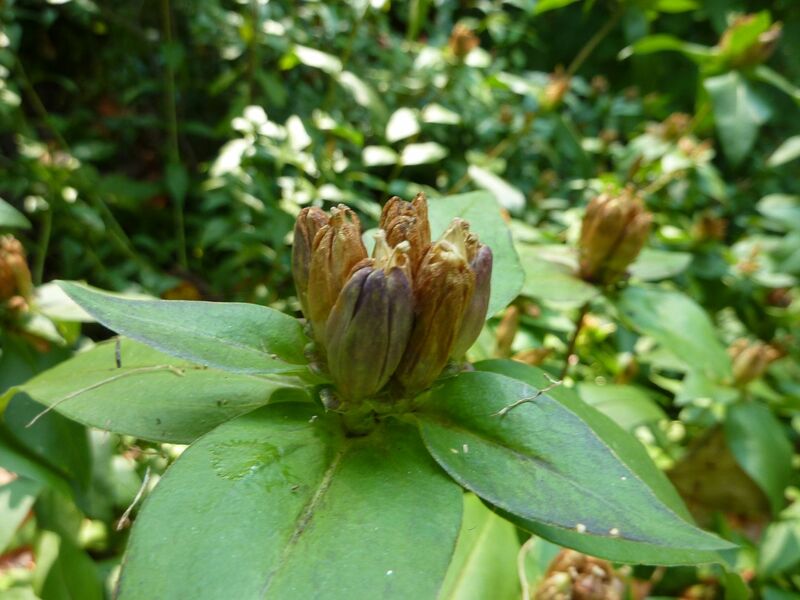 Gentiana andrewsii, only pollinated by bumblebees. 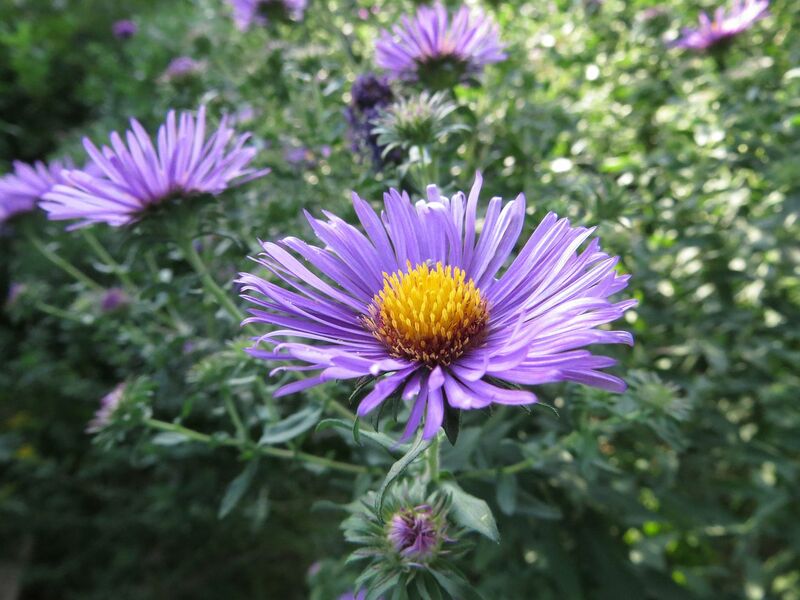 Georgia Aster, usually still flowering after the trees have dropped their leaves. (though there is the issue of them being covered in leaves). Jewel Weed, an annual that attracts hummingbirds as well as bumblebees, and has exploding seed pods. White Turtle Head, another one only pollinated by bumblebees. 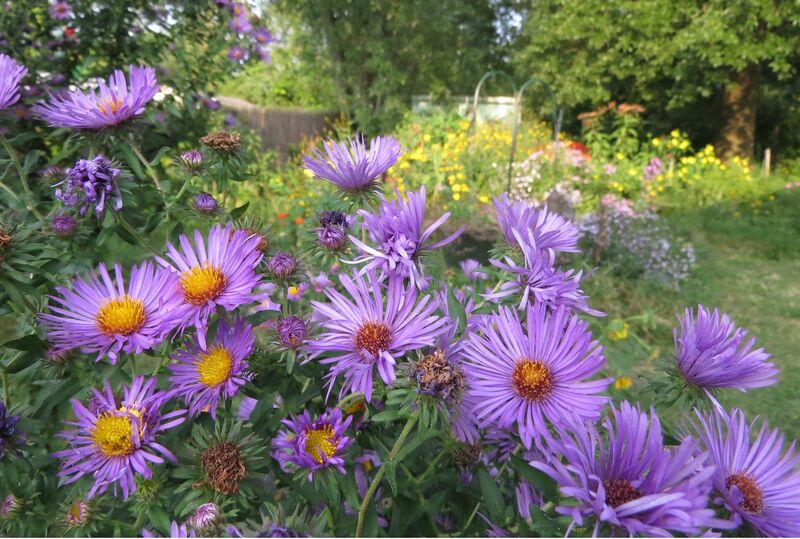 New England Aster, Symphyotrichum novae-angliae, is an autumn (late summer) highlight as always. And has only recently started spreading like a weed, presumably because it's not able to pollinate itself, but two or more plants will. Plants can also be divided. 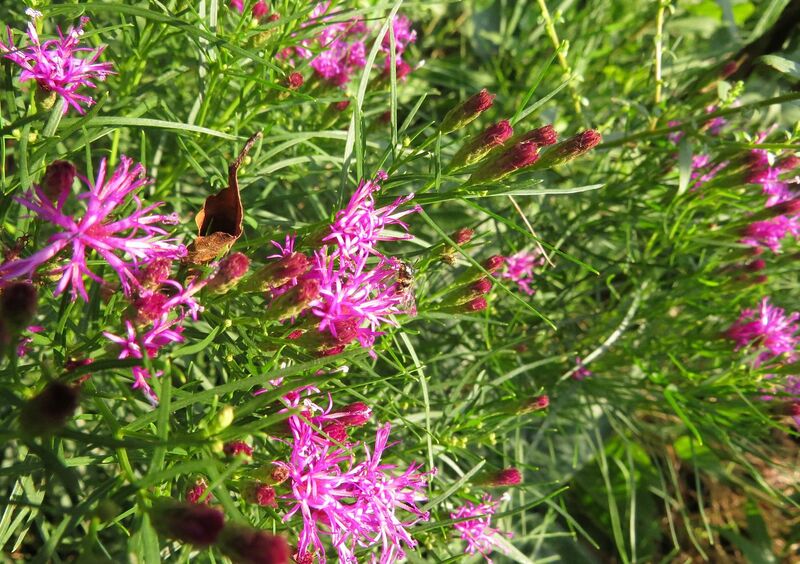 Narrow-leaf Ironweed, Vernonia Lettermannii, curiously enough the flowers this year are pink, last year they were purple. I'm not sure what caused the change. Supposedly this is the cultivar 'Iron Butterfly' though I'm not sure what's so special about it. Showy Goldenrod, Solidago speciosa, has petered out a bit in my garden, but new seedlings are at that flowering age now so hopefully it hangs in there. This isn't the best example because usually there are way more flowers, but they always produce a compact amount of them at the top of each stem. Yellow Passionflower, Passiflora lutea, is a timid member of this aggressive genus. I'm not sure if it's hardy here in zone 7 (previously zone 6 as of a few years ago), so hopefully it survives. Calling it a "Passion Flower" isn't entirely accurate because the flowers are not very showy and simple by comparison to other Passionflowers. I have yet to see the flowers open fully too, presumably they close by the afternoon or require full sun to open. Fruit-wise it's said to be inedible, with sources saying it's better used in the production of ink... yuck. 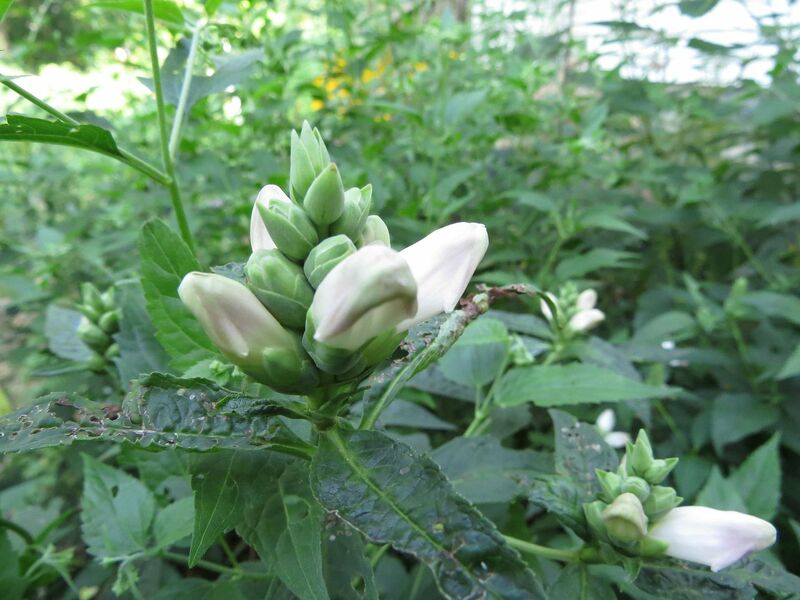 White Turtlehead, Chelone glabra, is not a particularly showy plant but it's good if you have a wet spot in partial shade to full sun in need of some late blooms. This is the host plant to the Baltimore Checkerspot, a locally threatened species of butterfly with an odd life style. Basically the caterpillars form a communal net on the plant and over winter inside it. Come spring they emerge still as caterpillars but are less picky about what they consume. 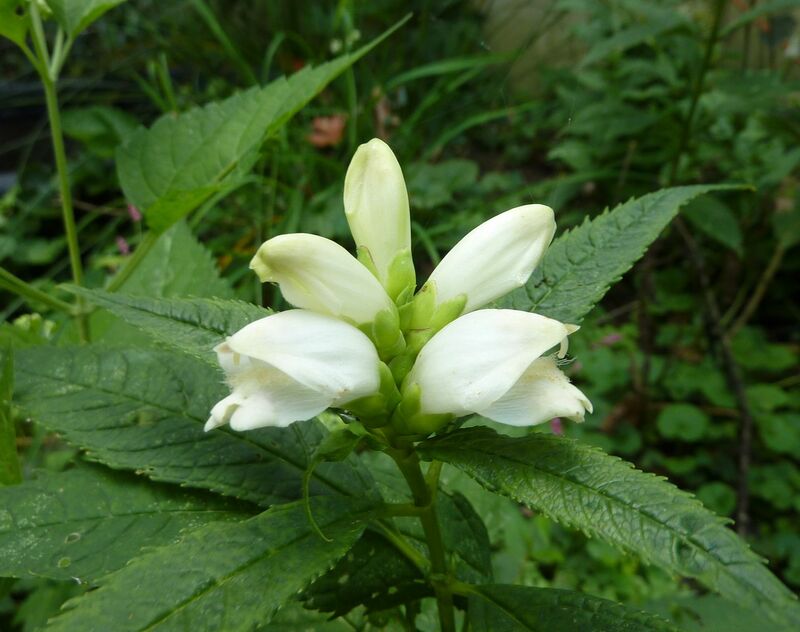 Their host plant, Turtlehead, probably hasn't broken ground yet for the year so they turn instead to other plants like Monkey Flower (which I have yet to grow successfully). 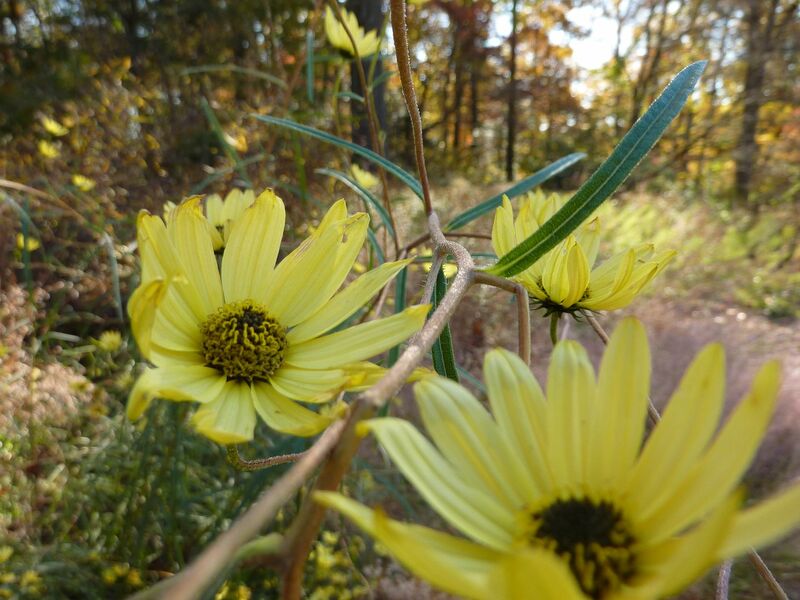 Tall Coreopsis, Coreopsis tripteris. This is kind of a deceptive photo because it's taken at eye level. I'm about 5'7" and that's where this plant gets its name. They can grow to be 10' tall though individual plants often stick to a max size each year, which makes cultivars easy to pick out because they can selected to be a specific size. 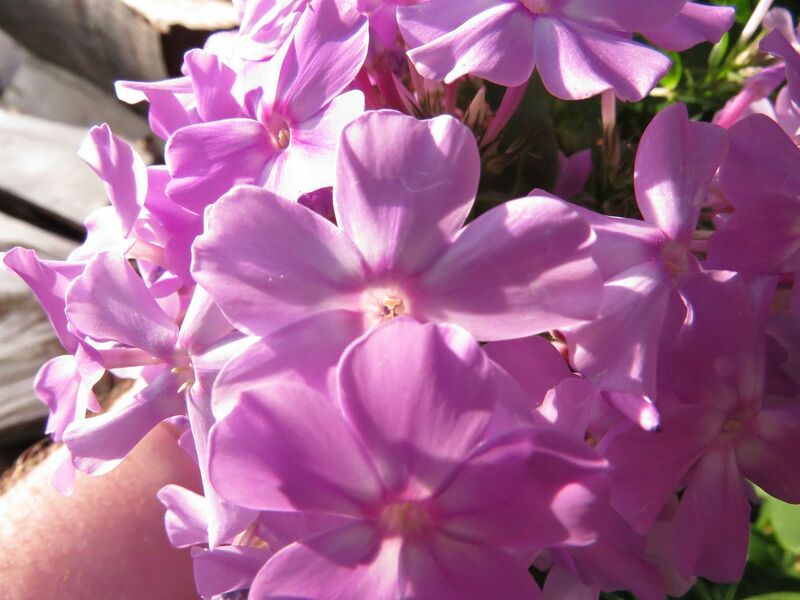 Summer Phlox. Don't know the species, don't really care either. Years and years ago I planted this in the front garden where it was too shady for it to flower. Now that we took down a street tree that seems to have opened up enough light to give what I honestly thought was a Bee Balm for the longest time to flower. Most impressive of all is this Northern Blazing Star, Liatris borealis. 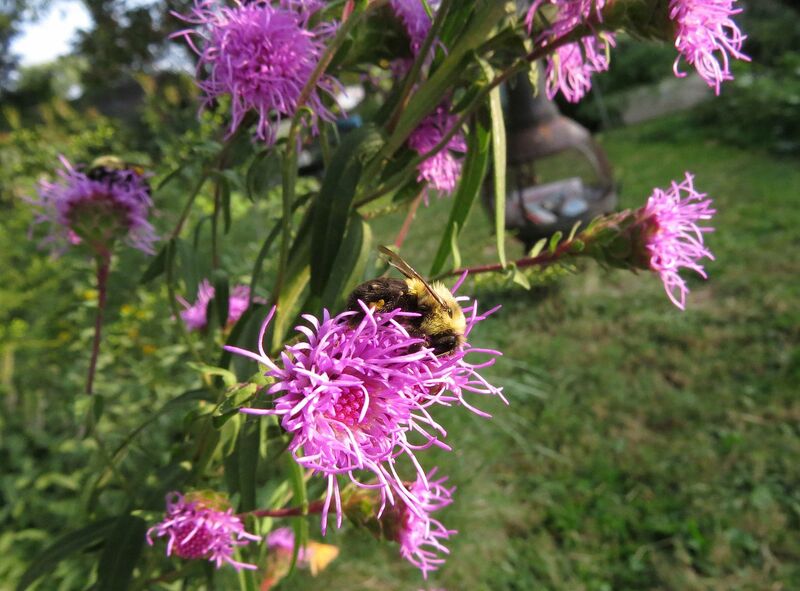 The flowers are almost twice the size of Meadow Blazing Star, L. ligulistylis. The height is easily 5' tall also contrary to what the nursery I bought it from (and others!) said it only grows to 2' tall. Granted this is an enormous bulb almost the size of a baseball and it sent out three canes, two of which fell over, but the main one in the center is pushing strong. Note how the flowers extend away from the stem some on their own stalk, well this is the only Liatris species I've seen that will put more than one flower head on those! It's putting the New England Aster next to it to shame at this point. I'll post more pictures of it later. 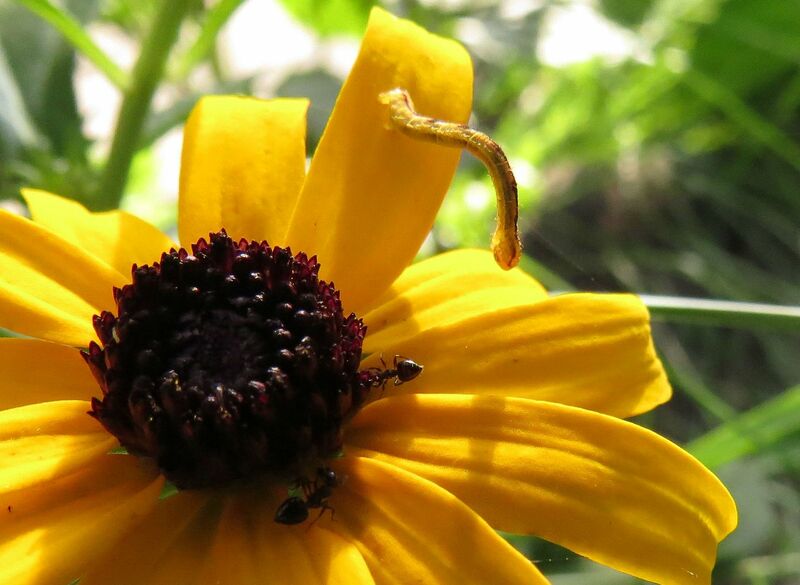 I realized earlier that there were aphids on the developing seeds to the Black Eyed Susans I have in the front yard. They're also under the flower somewhat. They used to only be here but have since moved up to the seeds and within spent florets. 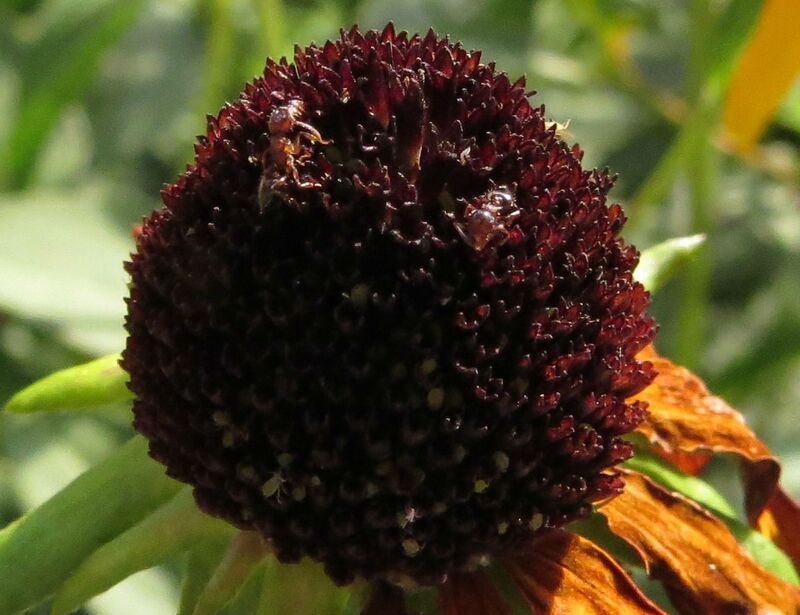 What's odd is that the ants are tending them and this is boarder line an in-between with tending aphids and nectar thieves. It's odd finding aphids filling this roll.